Retracing a journey from Ballinrooaun to a Boston bank. When Mary Griffin and her youngest son Thomas left the townland of Ballinrooaun, in the Moylough civil parish, and boarded The Scythia in Queenstown for the ‘New World’ on May 24th, 1892 little did she think that precisely one hundred and twenty one years on that very day, but five generations later, her descendants would reverse that journey and land on Irish soil solely for the purpose of tracing their own roots. 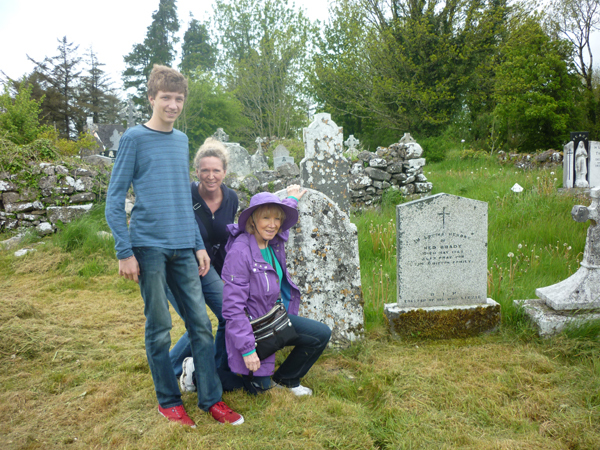 But so it was when Mary Griffin’s great granddaughter, Margaret (Griffin) Clark and Margaret’s own daughter, Suzanne Butler, and her grandson, Billy Butler, arrived to visit their ancestral locations in Ballinrooaun and Mullaghmore South to see where that initial journey all began. Mary Griffin, formerly Mary White from Mullaghmore South, married John Griffin, from Ballinrooaun, on January 19th, 1858 in Moylough church and they raised six children. Prior to John’s death on November 20th, 1891, five of these children had already emigrated and settled in various Boston suburbs and a few months after that event his wife Mary, now a widow, and last remaining son, Thomas, also set sail for Boston. Mary was by now almost 60 years of age and it was rare for a woman of her age to uproot and undertake such a long and often difficult journey but this may have been prompted by the fact that so many of her children were already in Boston. John and Mary Griffins only other son, Edward Joseph, who himself arrived in Boston in 1887 and who worked as a carpenter and street car conductor was ultimately to carve out a very special niche for himself in the North Cambridge area of Boston in a very different sphere. From personal experiences Edward had long recognised that the banks in the local area would not provide French or Irish emigrants with home mortgage loans and he set about establishing the North Cambridge Co-operative Bank whereby the pooling of resources now made these possible and the new bank opened its doors on July 9th, 1912. As well as being a member of its first Board of Directors Edward, who was also its Secretary and Treasurer and later to become its president, shared a vision that this institution would always remain true to its core values and that it should remain a single branch bank and so it remains today and continues to flourish at 2360 Massachusetts Avenue where it has been astutely steered through many turbulent periods in the domestic and global financial world. Edward would most likely have left these shores with little or no formal education and while he would have spoken the English language he would also have been fluent in his native Gaelic tongue but his undoubted foresight, initiative, creative talents and business acumen were to blossom in Massachusetts and indeed many of Edward’s descendants were to continue to have an ongoing involvement with bank in many positions of authority. Edward himself became a member of, and major contributor to, many important and influential financial and commercial organizations within the city of Boston. Edward died in his adopted Cambridge on May 15th, 1953 but his rich legacy lives on. 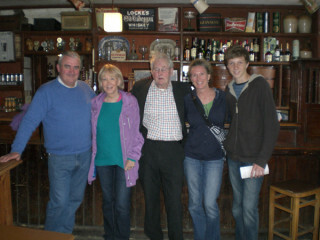 Today’s story began when Joan Koesterherm, a fifth generation descendant of John and Mary Griffin and a cousin of Margaret (Griffin) Clark, posted a query on the Moylough parish section of the Ireland Reaching Out website in October of 2012 seeking information on the Griffin family and links were soon established and so the process got underway. Joan had already done very extensive and detailed work of the Griffin family history since they arrived in the Boston area and she was very keen to now give this that vital Irish dimension. Many locals here provided her with all of the information that they had access to and further expanded this to include the extended Griffin and White families and thus a very complete picture now exits. 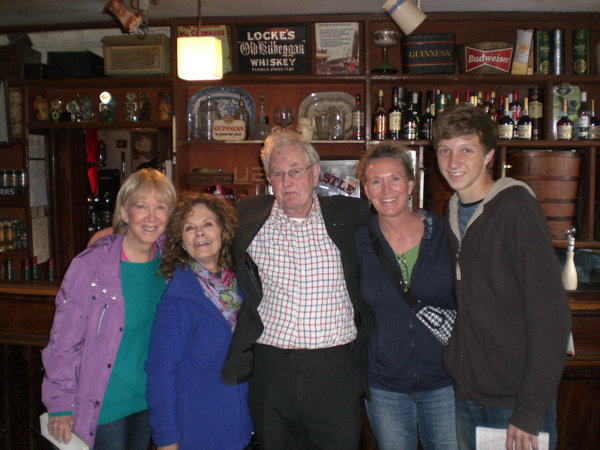 Some of Joan’s other relatives immediately recognised the significance of this and to coincide with the Gathering 2013 the visiting group along with a family friend, Kitty Woodward, were taken to all of the important locations by TJ Carthy, Sean McHugh and Jimmy Laffey. 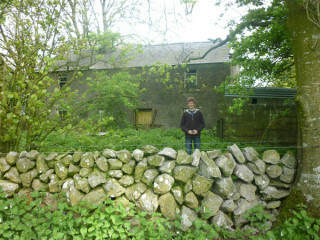 These included the locations of the Griffin and White homes and farms, their burial plots in Killoscobe graveyard, Skehana church as well a visit to Padraic and Mairtín Connolly’s cottage specifically to give them an idea of what a typical house and living conditions of the 1800’s might have offered. During the tour the group were very appreciative of the most welcome refreshments and food prepared by Margaret and Kelly Marie Carthy and of course it provided them with the very unique opportunity to meet local centenarian Bridget Carthy who is now in her 103rd year. 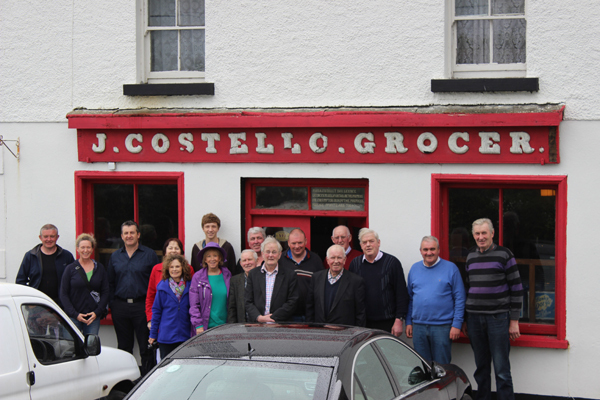 The day finally came to a close when a group of local neighbours gathered at Costello’s in Skehana where a brief history of the relevant townlands and families was presented. Indeed Margaret, Suzanne and Billy met with the current occupiers of the original Griffin farm with Michael Ruane, Danny Geraghty and Eddie and Tommy McGuire present and the latter made the journey from Birmingham especially for the occasion. Tom Costello extended his usual hospitality and imparted his great local history and knowledge in a most factual and entertaining interview and made a presentation of ‘Until Gooseberries Grow On A Tongs’, a book covering the history of St. Joseph’s National School Ballinruane, and official Gathering 2013 certificates were also presented to the visiting group and signed by all persons present. It is hoped over the coming months and years to extend the research and further explore the Griffin and White families on both sides of The Atlantic Ocean and thus further enhance our understanding and long term relationships.